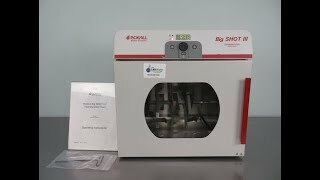 The Boekel Big Shot III Hybridization Oven offers you a wide variety of Incubation and Hybridization applications in a high capacity format. This convection oven is an ideal choice for labs working with protein identification, DNA and RNA research and western blots, thanks to their superior reliability and temperature control. The Big Shot III Hybridization Ovens are particularly favorable as they’re fully automated with walk away ability, and efficient mixing. The carousel within the hybridization oven accommodates a variety of tubes, microplates and bottles, to fit your individual needs. The rotation of the plates within the hybridization oven is constant, giving you more reliable results as the probes used to identify the protiens to be more evenly distributed over the membranes. The Boekel Big Shot III Hybridization Oven reaches its max temperature of 99°C in about 30 minutes keeping down time low, and operates on a standard 115V outlet. The standard plug and small foot print of this lab convection oven means you can place it wherever its needed most, freeing up valuable floor space in your lab. This Hybridization Oven is both UL and C-UL listed along with CE mark. Contact us today to learn more about our Hybridization Ovens. 19 x 14 x 19"
The Boekel Big Shot III Hybridization Oven has been thoroughly inspected and is performing to expectations. All of our lab equipment comes backed with our standard warranty. Should you have any questions, please don't hesitate to contact us.